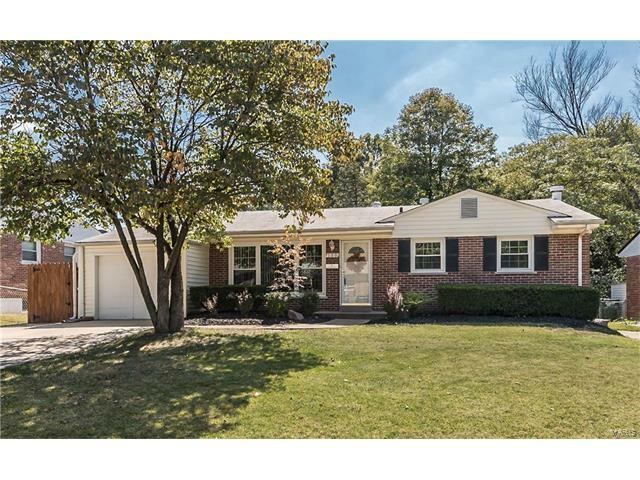 Beautiful Brick Ranch Home in Florissant! 3 Bedrooms, 1 bath, 1 car garage with a 2 car driveway. Living room with newer front door, Updated kitchen with newer stove, sink, dishwasher, microwave, countertop, sink, backsplash and laminate floor. Breakfast room with built-in corner hutch, crown molding, ceiling fan, wood blinds newer storm door and laminate flooring, Updated hall bath, Partly finished basement with some finished walls and flooring, Freshly stained deck with awning, Huge fenced backyard with storage sheds and a great dog kennel. New windows from Delco with transferable warranty to new buyer. Updated lighting and ceiling fans, Other updates include: a/c vents, glass closet sliding doors, hall bath with shower installed, sink & faucet, wood blinds, exhaust fan, Much More!